Sweet, sweet desk real estate. Where have you been all my life? 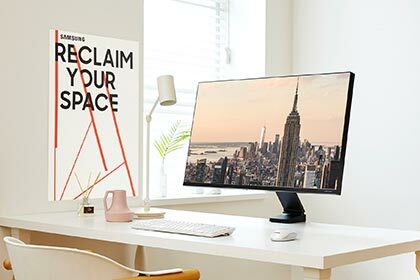 Samsung’s new Space monitor gives back a lot of, well, space, and it also happens to be a really nice screen too! Until this design, if you wanted to get seriously fancy with your monitor positioning you could go buy yourself a special VESA mount to put your screen on a swing arm. But this is a fresh take on tidying things up right out of the box. The combo of a full flat style to make it sit flush with the wall if your desk is against one, but to also allow for tilting the screen down low to the desk as well shows a lot of good planning has gone into this one. And the super tidy cable run once again pushes my buttons like the Razer Raptor did. The Space Monitor comes in 27-inch and 32-inch sizes, running at QHD (2540×1440) and 4K (3840×2160) resolutions.